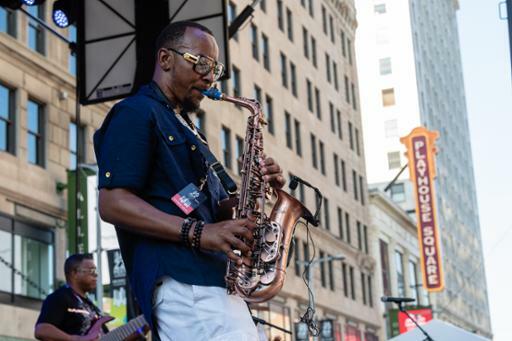 Tri-C JazzFest Cleveland, presented by KeyBank, has opened an online application for local and regional bands to play the outdoor Strassman Insurance Stage at Playhouse Square as part of the festival’s 40th anniversary celebration. A committee of music industry experts will select the individuals or groups for the stage lineup. A variety of musical genres will be considered, ranging from jazz (of course) to blues, R&B, funk, gospel, jam band and reggae. Sixteen acts will ultimately take the stage to entertain JazzFest crowds between 3 p.m. and midnight on Friday and Saturday of festival weekend, June 28-29. Last year, the committee vetted nearly 100 applicants before finalizing the selections. Applications will be accepted at www.tri-c.edu/jazzfestcall through March 25. The 40th annual Tri-C JazzFest runs June 27-29. The festival includes nine ticketed concerts inside the historic theaters at Playhouse Square, plus the free outdoor shows and other activities. Visit www.tri-cjazzfest.com for a schedule of ticketed shows. The 2019 lineup includes Tower of Power, Béla Fleck & The Flecktones, John Scofield, Christian McBride, Dianne Reeves, Jeff Lorber, John Clayton and many others. Festival passes — which offer VIP seating to all nine ticketed concerts, plus other perks — are now on sale. Cost is $250, a $150 savings compared to buying single tickets to all nine shows. Visit jazzfest40.eventbrite.com to purchase. Individual tickets will go on sale April 1 through the Playhouse Square Box Office at 216-241-6000 or at www.playhousesquare.org.